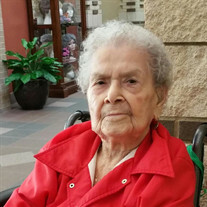 McAllen - Rebeca Cardenas, 91, entered eternal rest on Wednesday, September 5, 2018 surrounded by her family at the Braircliff Nursing Home in McAllen. Rebeca was born on July 16, 1927 in Rio Hondo, Texas to Victor and Virginia Reyna. She was a long time resident of McAllen. Rebeca enjoyed being with her grandchildren and great-grandchildren. She loved to garden and sing. Rebeca loved going to church whenever she got a chance. Rebeca Cardenas truly enjoyed life to its fullest. She was preceded in death by her parents; her husband: Jesus Cardenas; her son: Jesus Cardenas, Jr., and her daughter: Sylvia Cardenas. Left to cherish her memory are her five children: Blanca (Luis) Salas, Gloria (a� Mario) Rios, George and (Kelly) Cardenas, Irma Cardenas, Yolanda and (Juan) Nunez; grandchildren: Sandra, Sylvia, Melissa, Luis Jr., Angelica, Gloria, Rebecca, and Jessica; 13 great-grandchildren.